Susan is a self-taught artist. She resides in Bethlehem, Pennsylvania, where she has studied oil painting at the Banana Factory, with a local artist, William Christine. Through William's tutelage, she was able to accomplish the understanding how oil paint flows into one another and how to create all colors by using the basic colors. Recently, she has been leaning toward acrylics because of the array of vibrant colors available, and also how it challenges her. At one time she felt intimidated by this medium, but she has learned to manipulate the consistency of the medium in her creations. The unique style and nuances reflected in her paintings and photography synthesizes her love of what surrounds her everyday life. 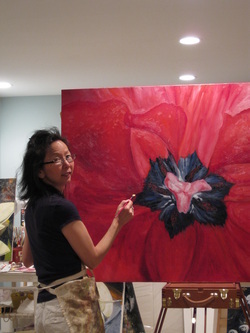 Although, she seems to gravitate toward botanical matters, she has found painting other subjects just as fulfilling. She loves painting whatever captures her eye. When she finds that particular subject which inspires her, she feels an increase of creative energy soar through her being. When she enters her studio and smells the paint, she gets this energy, an in anticipation in the pit of her stomach. Each painting is a new adventure. The painting unfolds before her eyes with each stroke of the brush across the canvas. The amazement to see the creation evolving is exhilarating. Again, she feels this spiritual energy moving her, coming through her soul and through her hands. After her cancer journey, today more than ever, she appreciates and respects the talent that was given to her. Her tumultuous storm has been eclipsed by the beauty of color. Constantly evolving in her artistic endeavors, she is always surveying her surroundings to inspire her next creation, sometimes it is just a blink away.